We’ve been having quite a few discussions internally and externally lately about how to be sure young people are ready for life after the Fourth Industrial Revolution. It has probably come into focus because it’s been a hot topic at the World Economic Fora in Davos these last few years. The term itself was coined by Klaus Schwab in a book by the same name. There is also an interesting podcast that came out of this year’s World Economic Forum on the topic a couple of weeks ago, which is very much in line with many of our thoughts on the subject. What do we mean by the Fourth Industrial Revolution and what were the other three? The First Industrial Revolution was when we started to see urbanisation and steam engines, in the 18th and 19th centuries. Think textiles and iron. The Second Industrial Revolution refers to the introduction of mass production, in the beginning of the 20th century. Think factory lines. The Third Industrial Revolution is also known as the Digital Revolution. This started around the 1980s and includes extensive use of the personal computer and the internet. The Fourth Industrial Revolution builds on the last one, and represents the ways that technology is embedded in society. Think robotics, artifical intelligence, nanotechnology, quantum computing, biotech, the internet of things, digital fabrication and driverless cars. While the references above are high tech, we see this revolution all around us everyday, and we are – or should be – worried that our own kids will benefit from these advances. While we don’t know exactly how the big changes in data, pattern recognition, and automation will play out for each type of job, it is safe to say that every job in the future will have a technological component. Teachers will have technology that helps them personalise learning and better adapt their lessons to students’ individual needs. Healthcare will draw on data to make better diagnoses, and on automation to carry out precise robotic surgeries. Bankers are already being replaced by algorithms (and many of the finance professional we know personally are studying Python in their spare time to be sure that their skills are future-ready). Besides the actual tech that will facilitate jobs, it is clear that people will need to be life-long learners to stay on top of these advances, and adapt to the changes that will continue to occur, and accelerate, as the economy becomes more tech-driven. In everything we do at Fire Tech we look to embed 21st century skills, to give our students the experience, confidence, and curiosity to be ready for this future. Specific tech skills will be useful. We already see engineering jobs taking over where MBAs used to be dominant, with three times as many entrepreneurs holding engineering degrees vs MBAs. According to the Economist, Engineering and Computer Science degrees also have the highest return on investment, and the least dependency on the prestige of the institution. Probably even more important than specific tech skills, though, are the soft skills that will prepare our kids for their futures. Creativity: This may be the most important one, in my view, and it means that we still need art and music to fuel those imaginations, and a supportive and risk-welcoming environment where students can try new things. 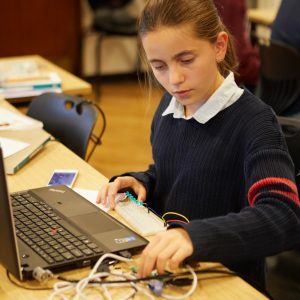 Creativity and tech are not mutually exclusive – we believe that tech at its best is highly creative and this is why we use project-based learning in everything we do. Collaboration: Team work is tough to assess and as a result isn’t always top priority in organisations driven by independent assessment (read: schools). However, IRL (in real life), it’s critical that our kids learn how to organise work, how to communicate with peers, how to take and give constructive feedback. Collaboration takes practice. Computational Thinking: This is distinct from coding itself. This is the ability to break down problems into specific steps. It helps us come up with analytical ways to deal with (and delegate) problems. It is also a necessary step to thinking about how to solve a problem with code. Communication: Your work is only as good as your audience’s understanding. If you have the most elegant solution in the world, but you can’t explain it to people, it will be worthless. And in communicating simply about complex topics, you consolidate your own understanding of the topics. Design Thinking: This is the process of designing something, testing it and seeking feedback, then making improvements and adjustments, and re-testing it until you are satisfied. This isn’t making one plan and sticking with it to the bitter end. This isn’t being emotionally stuck on the way that you initially expected a solution or product to work. This is staying curious, being open to feedback, and looking at attempts that don’t work as a necessary step on the path to success rather than a failure. Tech builds are bound to hit bumps sometimes and to benefit massively from this iterative model. It also builds in adaptability and resilience. Curiosity: Some would argue that curiosity is not a skill. But our view is that curiosity takes practice. Curiosity means throwing yourself into a project so that you care about the outcome and are driven to look for the best solution because you REALLY want to solve it. Curiosity means spending free time learning new things, and that’s a habit that can be developed. Curiosity means wanting to do the research because you want to know more and you want to keep learning. And curiosity requires that you care about the issue at hand, and that it is meaningful and relevant to you. Curiosity is also a key skill that keeps life intellectually interesting long after school ends. We embed these skills into everything we do. In our courses students aren’t “just” learning Java or Python or Photoshop, they are also learning to roll up their sleeves, get curious, take the knocks that come with taking creative and intellectual risks, and finish a project that they are proud to share and shout about.